Slightly different format this week there was so little training last week it’s not worth posting the figures. I trained more most days in the run up to the ITU Worlds than the whole of last week. I planned to rest and recover it just ended up going further than intended. I did warn that I struggled to practice what I preached in my Ironman Recovery post. I’m not going to whine about inadequate training or worry I’ve blown my Kona preparation. Let’s keep this in perspective and take a longer view. I’ve a chart I’ve plotted to help illustrate the point. Another Performance Management Chart pulled from WKO+. 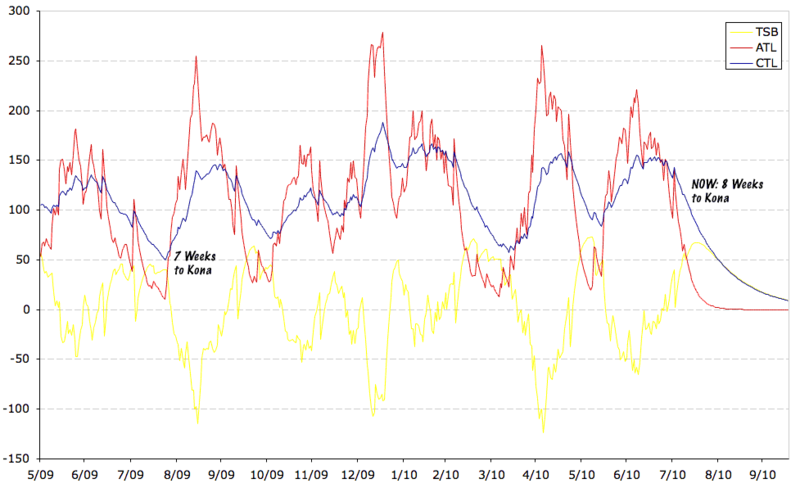 This plots from after Lanzarote 2009 to the present the period when I learnt to race well. I started to train harder, with greater focus and to manage my race weight with resulting Kona qualification and new PBs. I’ve noted two points. The first is the end of my 2009 Ironman UK recovery period. I took a two week break after Ironman UK and was pretty relaxed (read ate well). Aaround that time CTL (fitness) was about 50 with ATL (fatigue) lower still. Compared to today, the second point, just over a week after ITU long distance worlds and the end of another recovery period.CTL is roughly double last year’s whilst my ATL is similar. I may have been lazy last week, but I am rested and fresh (low ATL). More positive though is my fitness (CTL) is far higher than it was starting my Kona preparation in 2009. Not only is my CTL almost double the last year’s figure I’ve an extra week of training in this year’s build. High and low CTLs are not entirely indicative of performance I know from experience a high CTL tends to be a positive sign before a race. With lessons I’ve learnt from the lead in to ITU Worlds I know I need to build CTL as high as I can over the next six weeks. A large block of hard training that brings with it deep fatigue always works well for me. I need to hit my taper exhausted and wondering if I’ve done too much. I then need to taper more aggressively than I’ve previously tended to. One or two hard days, but lots of them light with the final week being particularly easy. I’m certain that from this starting point I can work to the level of fitness required to perform well in Kona. The trick is managing fatigue so I can keep building right to the taper. Then rest, recover and get ready for the race ahead. 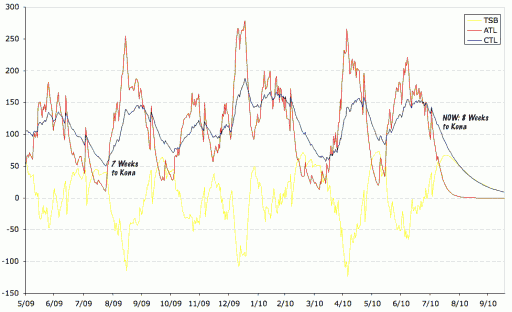 I’ll come back to taper plans nearer the time as there are changes from last year. It’s not all plain sailing. I developed a niggle in the left leg whilst reducing run volume tapering for Worlds. I’ve mentioned it before and it remains a point of frustration now. Oddly it’s most painful when I walk and disappears when I run! 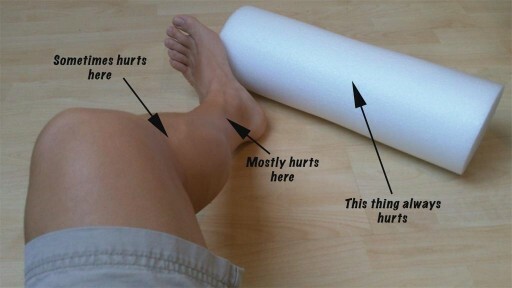 The pain occurs down in the shin, but almost certainly seems to originate in tight ITB/Glutes/Hamstrings. You could note two negatives in the past week relating to this. Either the pain itself which even made leading a gentle club run somewhat uncomfortable or that I’ve not used that foam roller or stretched enough to clear it. Not dealing with this thoroughly was dumb and essentially makes this week tougher work. I’ve promised myself foam roller sessions three times a day till it’s cleared. I’ll aim to build into running through regularity rather than volume it tends to work well for me and a number of my athletes. Once I clear the problem I’ll return to the higher run volumes of the previous block. I’m going to proceed with caution as my run fitness is good and if I just maintain that for a while it’s fine. I wanted a bike focus anyway! That wasn’t the only negative. Not being able to run makes it hard to get to the pool so I logged little time in the water. I’m determined to approach the swim with all seriousness from now on. For the next six weeks I will not swim less than 25km a week and every metre will count. Best to finish on a positive. I gained some weight last week as I was casual about my diet and didn’t burn calories at my usual rate. The important thing is I was only fairly casual and have not gained any more than I did after Ironman UK 2009. That quickly came off so I’ll be back on target shortly. To sum up week eight I was very, very lazy. However the result is I’m rested, fresh and ready to go. I’ve renewed determination to get myself to Kona’s start line in the best shape of my life and to follow through with a great performance. This year I’m starting from better fitness and have more time. I’d better use it wisely.